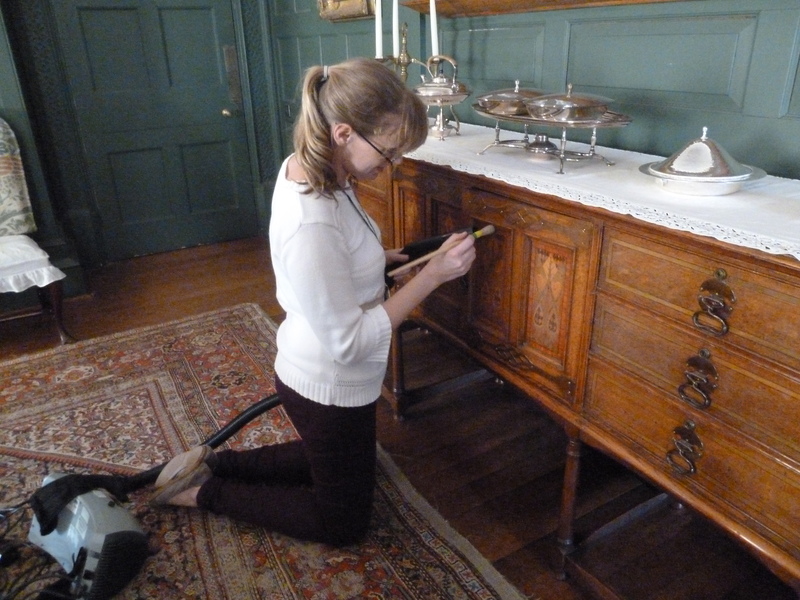 Running a historic house involves lots of different kinds of work, which we divide up into daily, weekly and annual jobs. One of the weekly jobs is to monitor the light, humidity and temperature. 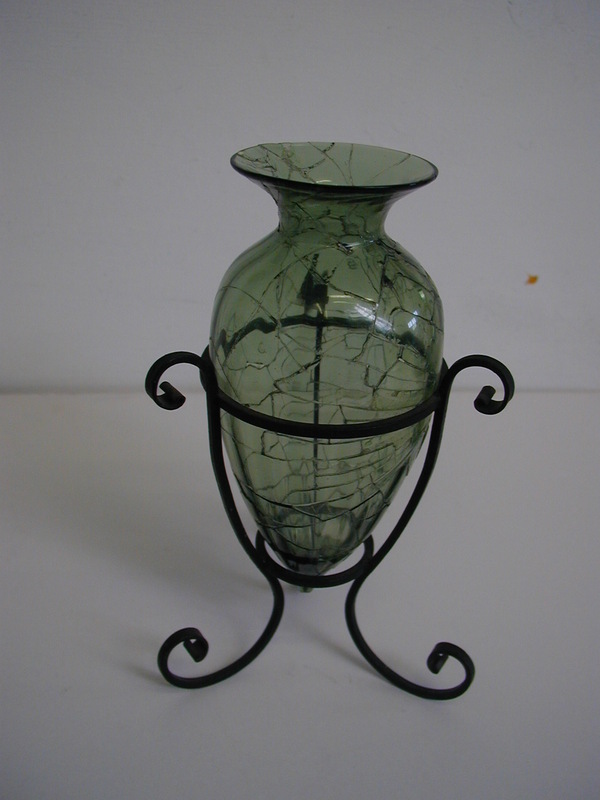 If the levels are wrong, than the collection deteriorates and becomes permanently damaged. 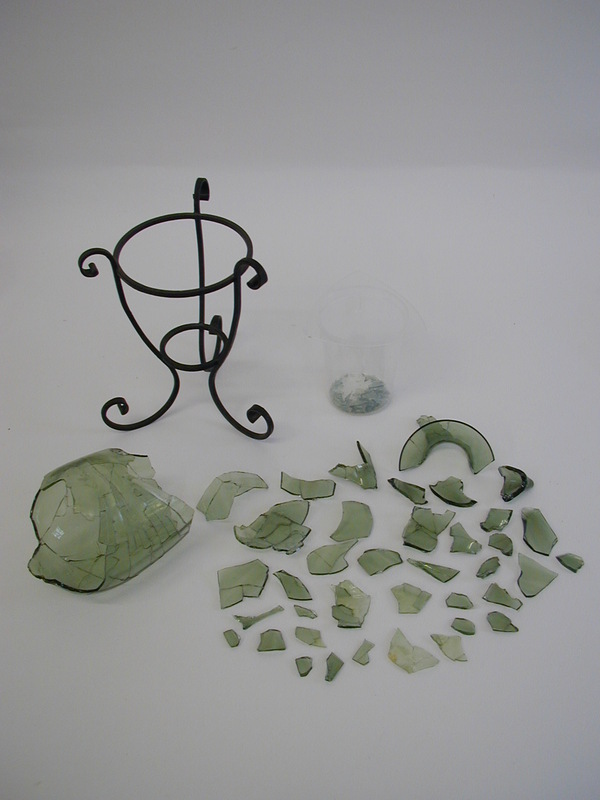 Light is one of the main causes of damage in any house, not just historic ones. It can be quite easy to see some of the damage through fading of colors but this is really only an outwardly sign of deeper damage. 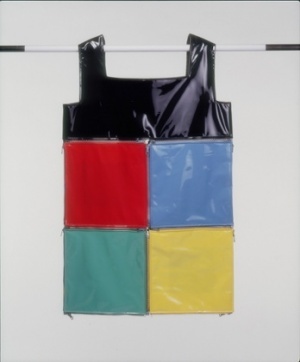 A high amount of light activates the chemicals, that make up the color, to react and change. 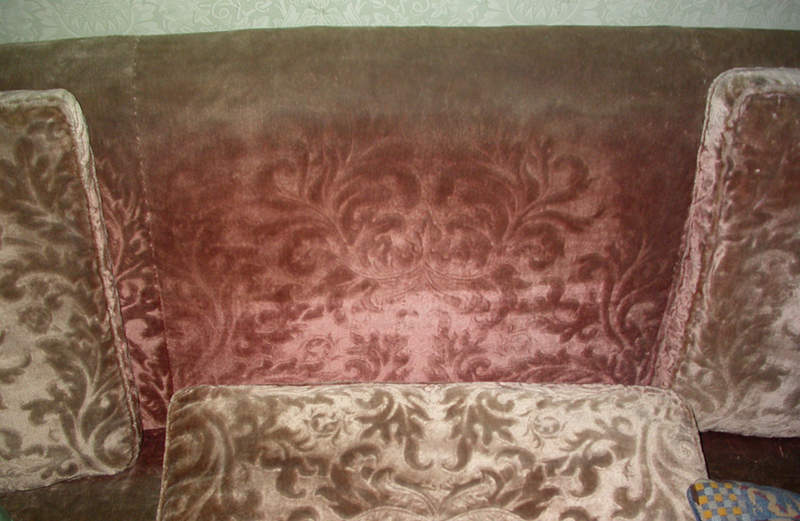 One of the best examples that we have here of this is the velvet upholstery on the sofa and matching chairs in the Drawing Room – they used to be a bright rose-pink but are now green. Light also affects the threads in fabric, causing them to break down and snap leading to tears and rips. Ever handled something that has fallen apart in your hands when you pick it up? This is what can happen to fabrics like curtains, carpets and tapestries. Humidity levels are different for every type of object. For example, the correct humidity level for metals is too dry for wood, which would cause the wood to dry out and split. 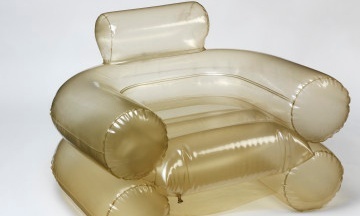 If the humidity is too low, organic materials like leather and wood shrink, crack and even in extreme cases, break. If the humidity levels are too high, than organic materials swell and stick, like drawers in a desk. 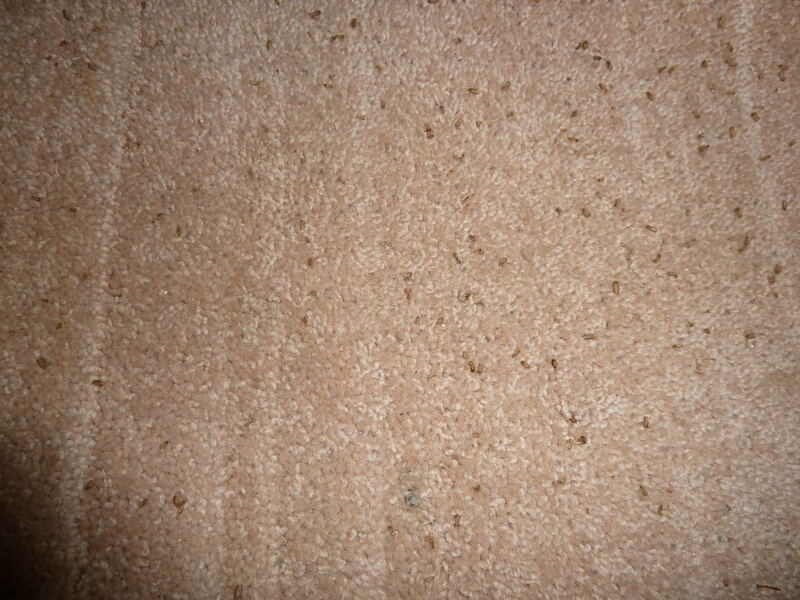 High humidity causes dampness which in turn encourages mould and fungi. It also attracts insect pests and cause metals to rust. Temperatures has two effects on collections. It is directly linked to humidity levels, so if it is hot, then humidity levels will be low and vice versa. Low temperature, especially sub-zero ones, will cause objects to become brittle and crack, whilst high temperatures can soften and melt some materials. It can be difficult to find the right balance between these factors, which is why we monitor them at least once a week. In order to attempt to prevent damage, we have set budgets. 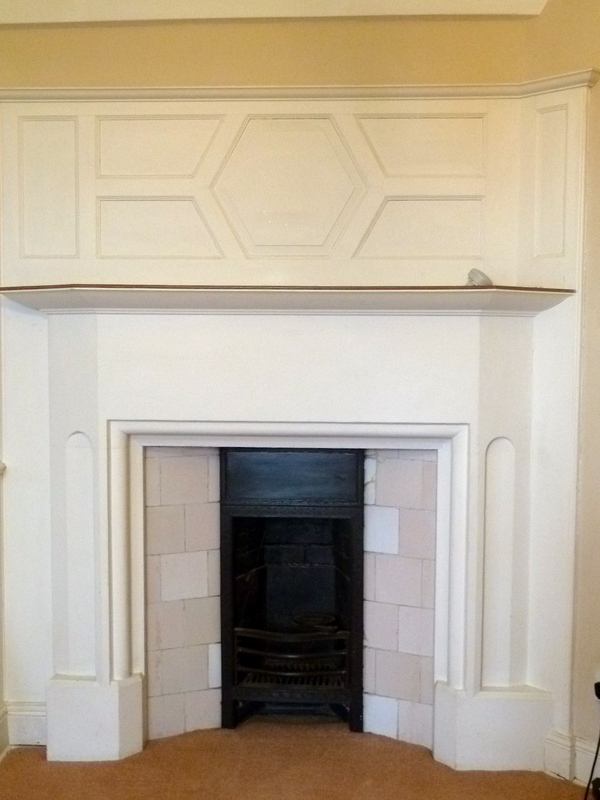 In every room, there are certain objects that have been deemed as at a higher risk than others, which is determined by several factors, their materials or their historical significance to the house. These are the objects that we measure off using an environmental monitor. 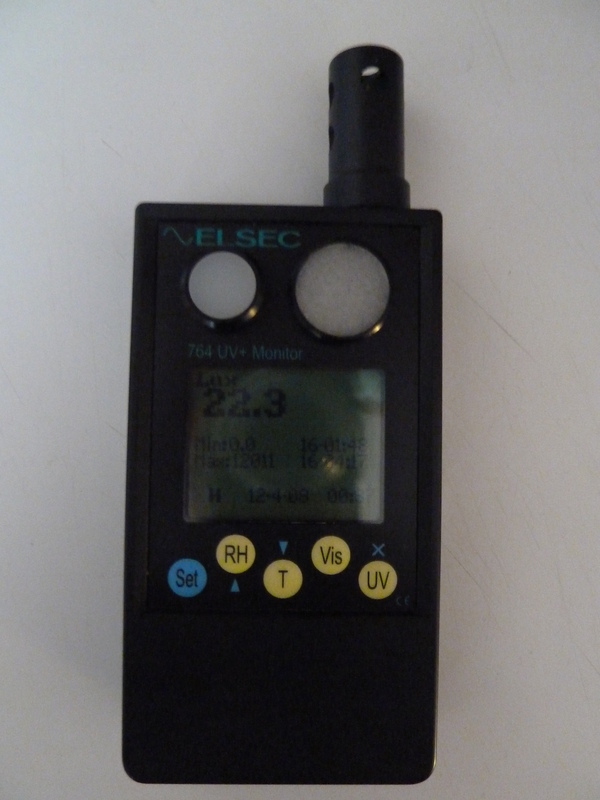 This measure light or lux levels, relative humidity (RH) and temperature. We record it manually and take action a level is too high or low. Light is the easiest to fix as we can adjust the blinds, which is why it can sometimes be a little bit dark at times. Humidity and temperature is a bit harder to fix as it often involves adjusting heating levels and putting out humidifiers/de-humidifiers. Categories: Uncategorized | Tags: Balance, bugs, Carpet, cleaning, collection, conservation, Drawing Room, Environmental Monitor, Furniture, Historic house, House, House Team, humidity and temperature, Humidity levels, light, National Trust, object, Standen, temperature, Wood | Permalink. 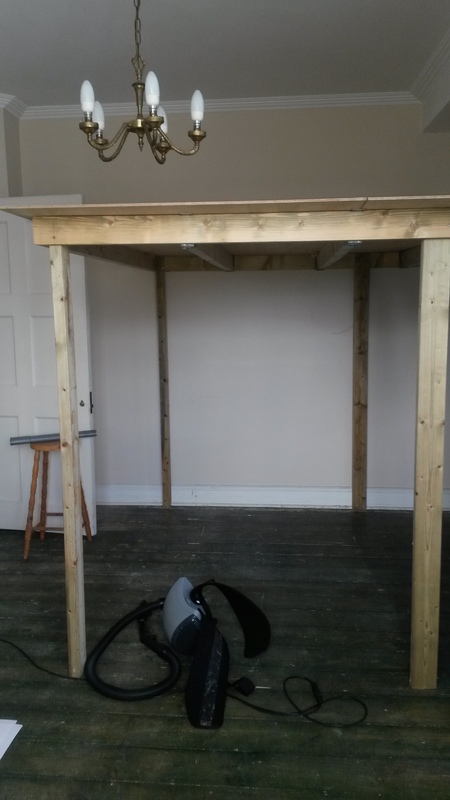 A couple of weeks ago, I wrote about the overhaul of the Protection Store and our subsequent discovery of an infestation of carpet beetle larvae, or ‘woolly bears’, as they’re known. 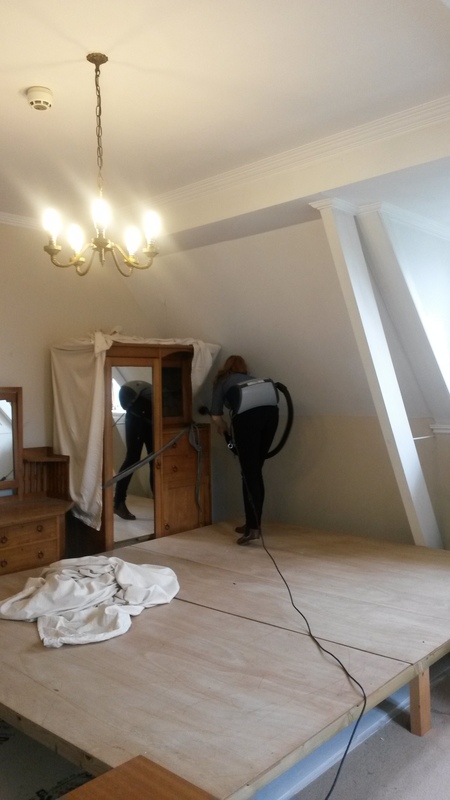 We had emptied the room of its contents in order to create better storage solutions, as well as inspect what we thought was a minor carpet beetle infestation. 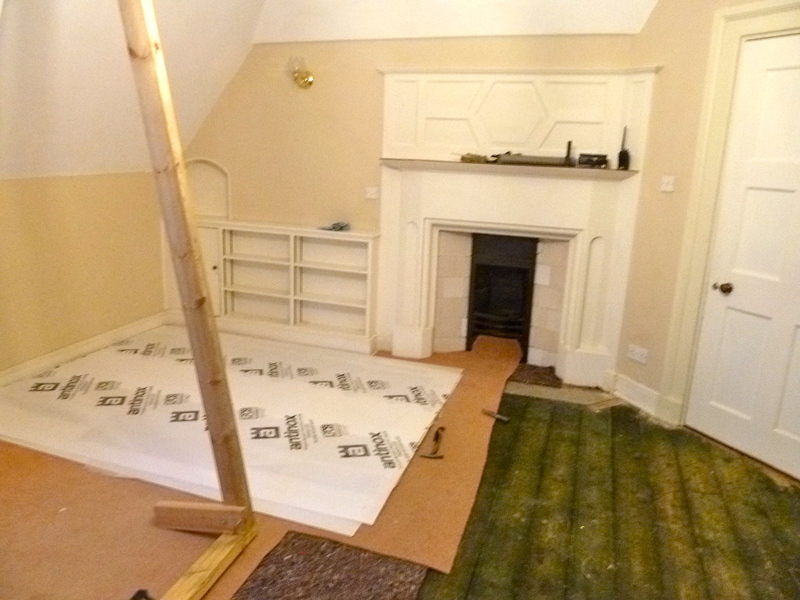 After discovering a rather more serious infestation than we had thought, we performed a hygiene clean in the hope that it might remedy the situation, but finally decided to remove the infested fitted carpet as a last resort. With the room now completely empty, we needed to think about how we would store the room’s contents more effectively – especially the fragile William Morris lino, which was originally stored under a platform of sorts. 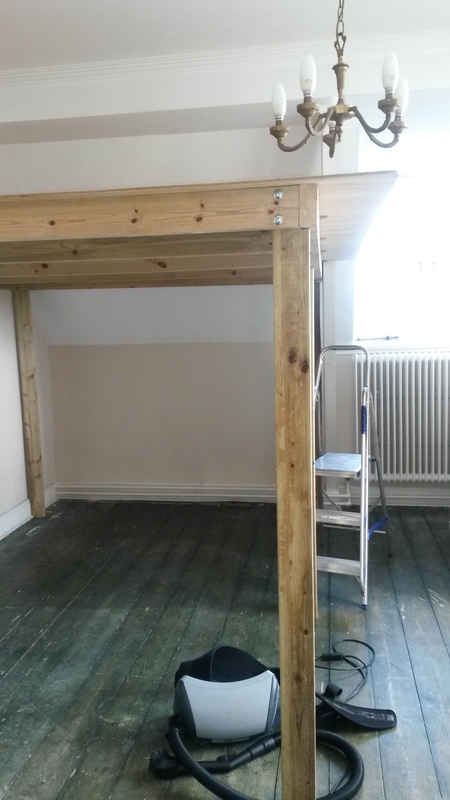 This platform had been custom-made by some National Trust volunteers, and while it was really useful to be able to store objects on top of the platform, we thought that we could probably maximise the storage in the room by raising the height of the platform, which would then mean the lino would no longer need to be stored on the floor. We recruited some of Standen’s Woodland volunteers to make alterations to the platform, and they did a great job. 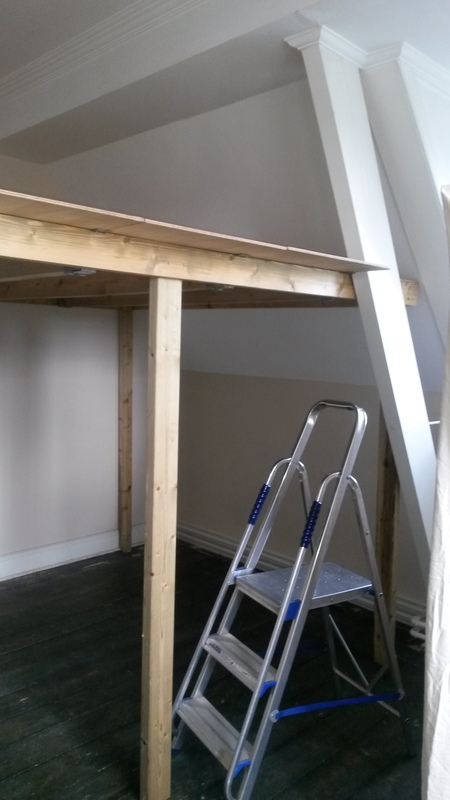 The platform was raised to about 5 ft 5 in, with plenty of room both on top and underneath for storage (though taller members of the House Team should mind their head when ducking underneath!) Most importantly, the Morris lino could be stored on top of the platform, out of harm’s way, therefore preventing further deterioration. On a side note, the Morris lino is a really interesting item from our stores, and one that, unfortunately, visitors are not able to see – I think this makes it a good candidate for a future Object from the Stores feature, so watch this space! 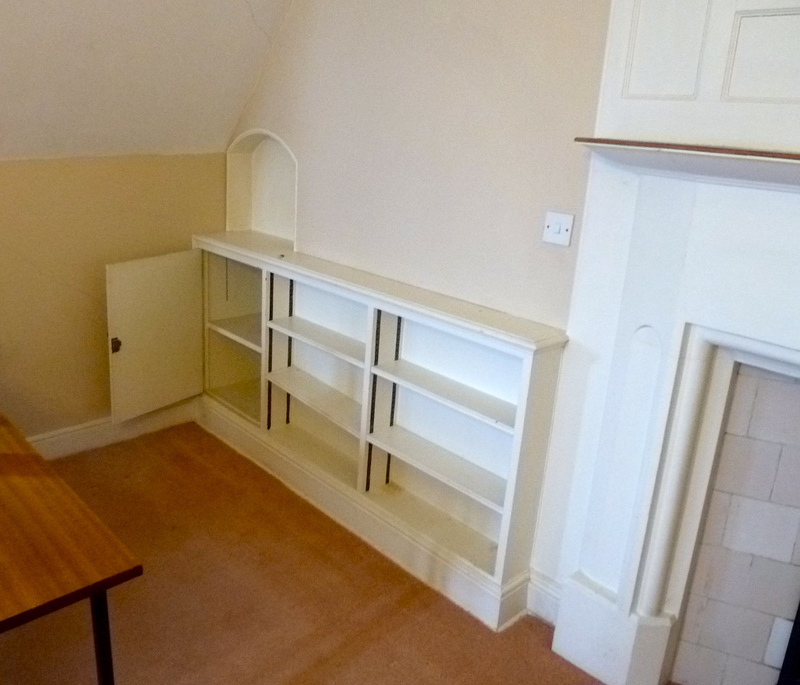 The platform is tucked away in a corner, freeing up the rest of the room for more storage! Categories: Uncategorized | Tags: bugs, Carpet, cleaning, conservation, Hannah, House, House Team, storage, volunteers | Permalink. You might have seen my post from a few days ago asking you to keep an eye out for our new Objects in Focus series…well, here’s our first object! This chair is on permanent display in the Hall, and it’s one of the first objects our visitors glimpse as they make their way into the house. I was always intrigued by its unusual shape, and having had a number of visitors ask me about the origins of the chair, I thought this would make a good starting point for our spotlight on objects. 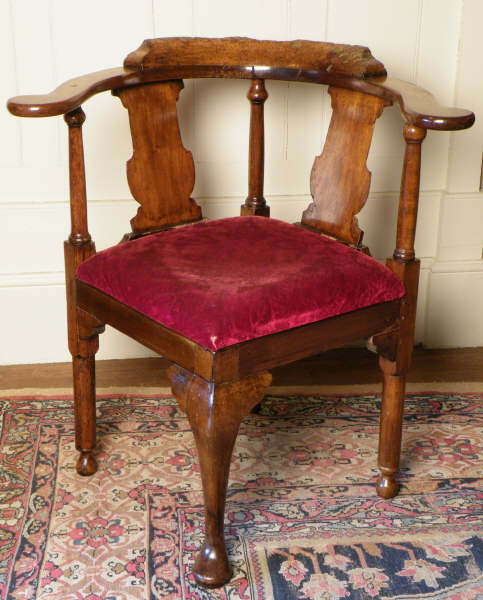 The chair is from the 18th century, and is an interesting shape; described as a ‘corner open armchair‘. It is made from fruitwood, and the seat is covered in red velvet. 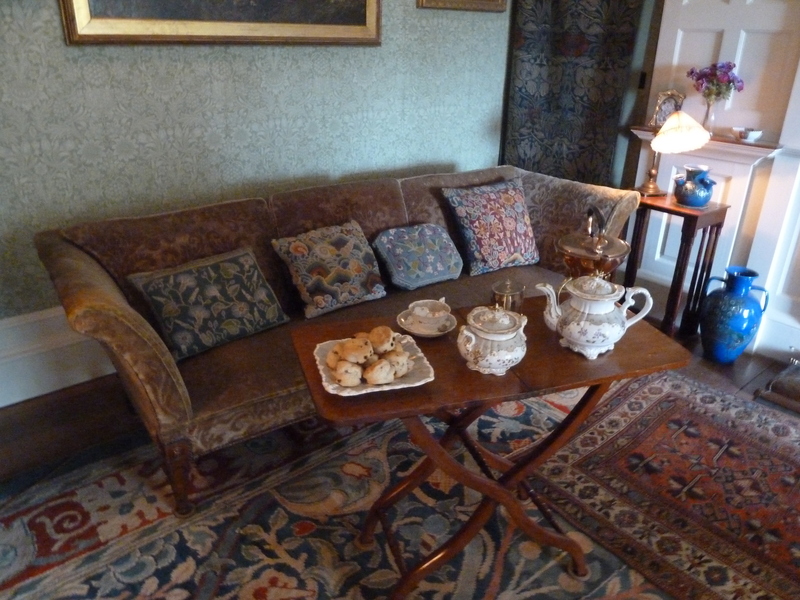 This piece of furniture is particularly interesting, as we know that it belonged to the Beale family before Standen was built, and they brought it with them when they moved here in 1894. Commode chairs like this one were not unusual in the 18th and 19th centuries. A chamber pot would have been hidden underneath the removable seat, and the chair placed somewhere discreet, such as a bedroom. The Beale family were great admirers of antique furniture, which they thought was often better made and more refined than the furniture they could buy new. 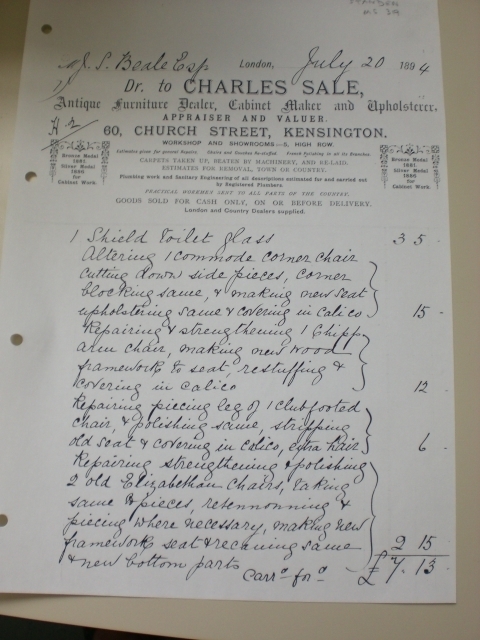 It would not be unusual for them to buy antique furniture and then pay for it to be repaired or altered so that it better met their needs. The back of the chair is rather damaged. At first glance the chair appears to be a well-loved and well-used piece of furniture, but the damage is not from use or age: it was actually caused by a woodworm infestation. Woodworm are the larvae of furniture beetles, and they live and feed inside wood, often causing serious damage to furniture. 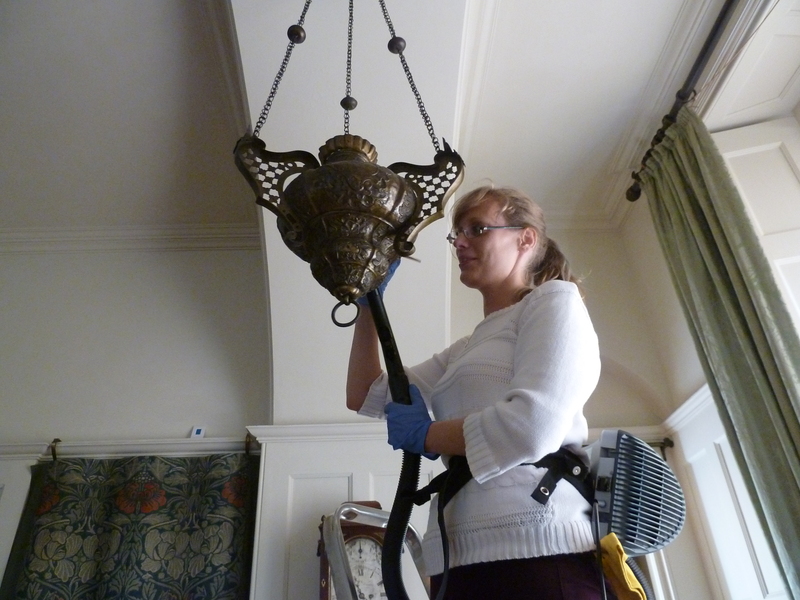 The best line of defence against future pest damage to our collection is cleaning and inspection, and controlling the conditions objects are kept in. Categories: Uncategorized | Tags: bugs, Chair, conservation, corner armchair, Furniture, object, Objects in Focus, Standen | Permalink.